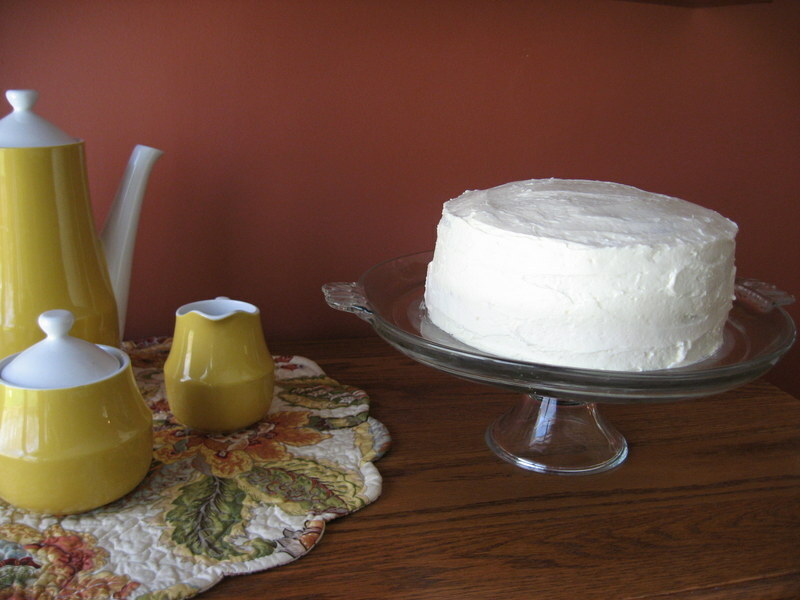 This decadent Red Velvet Cake was a family tradition in my husband’s home. As he grew up, his mother baked this yummy treat for every family member’s birthday. Every year. Same cake. And after one bite, I knew why it was everyone’s favorite. 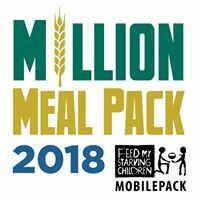 It is moist and full of body and texture. It is delicious. 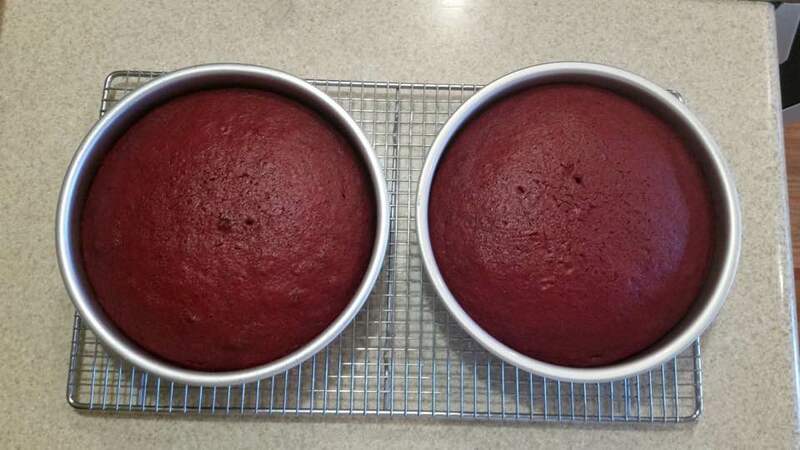 I have continued the tradition of Red Velvet Cake for the birthdays in our home. It is a tricky cake to master, and it took a few “it’s ok” cakes to get to the “wow, this is SO good” cake. As our kids grew older, they were given their choice of any baked good for their birthday. 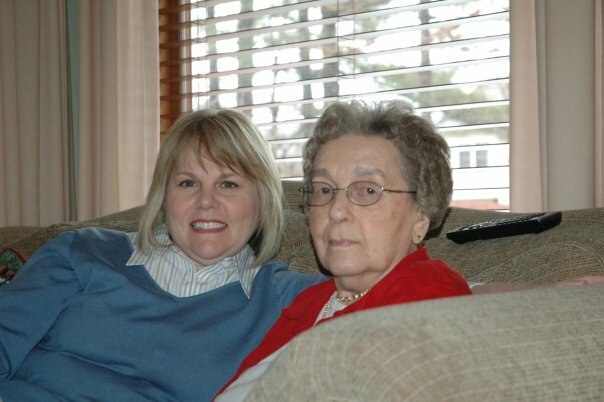 Cherry pie won out a few times, but on most of their birthdays, red cake was in the oven. One of the challenges when making this cake? Red food coloring may end up on your hands, counter and just about everything else in your kitchen. Sometimes I am surprised where I find a splash or two long after the bowls and cake pans are washed. My recipe card is a little embarrassing as the years of baking are evident. I would make a new card, however, my daughters like the splattered and bent card and all it’s messiness. They say it holds value to them just the way it is. Memories in every drop of red food color. I love that. So the card always gets tucked back into my recipe box, waiting for the next birthday. However, I have actually made some changes to the recipe ingredients over the years. 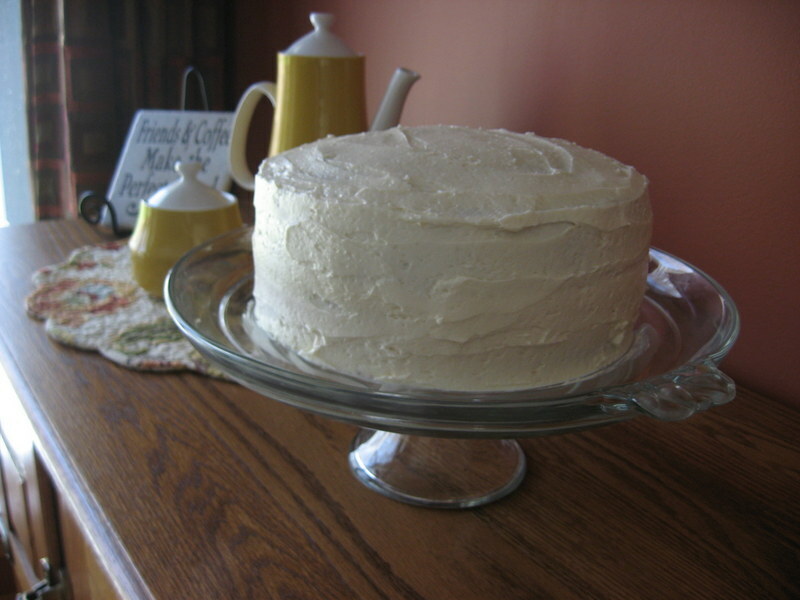 The original recipe called for shortening in both the cake and the frosting. I now substitute butter and am very happy with the results. 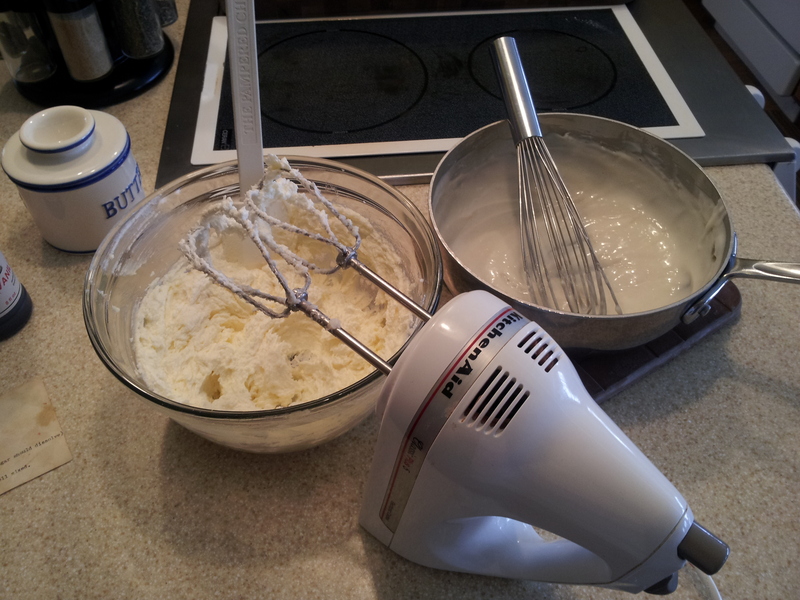 The frosting itself is a bit unusual as it is made with flour and granulated sugar; an odd combination for an icing. It takes lots and lots of beating. And then some more. The result is a light, fluffy melt-in-your-mouth perfection. Baking a cake from scratch is an act of love. It takes time and patience and a bit of expertise, but the homemade confection is worth the effort. 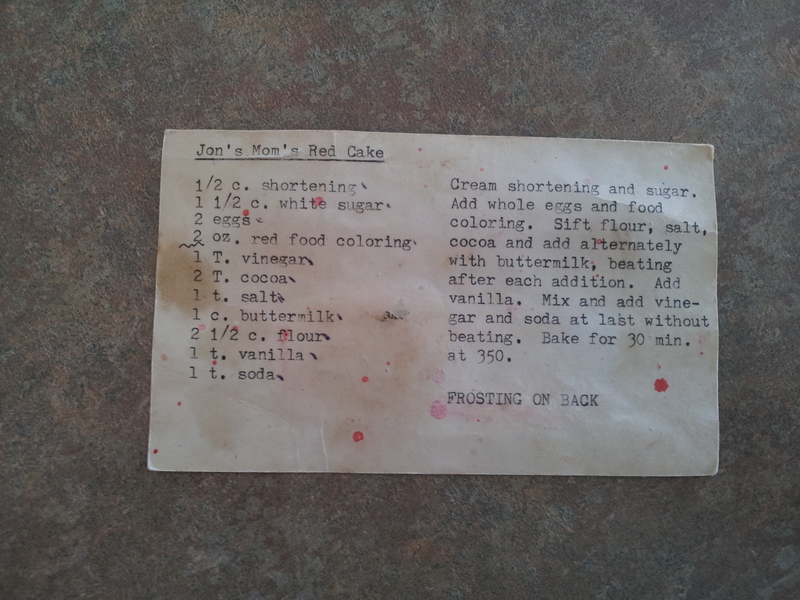 I love that Jon’s mom started this tradition and I can now pass this recipe along to my daughters. I hope they bake it for their kids. 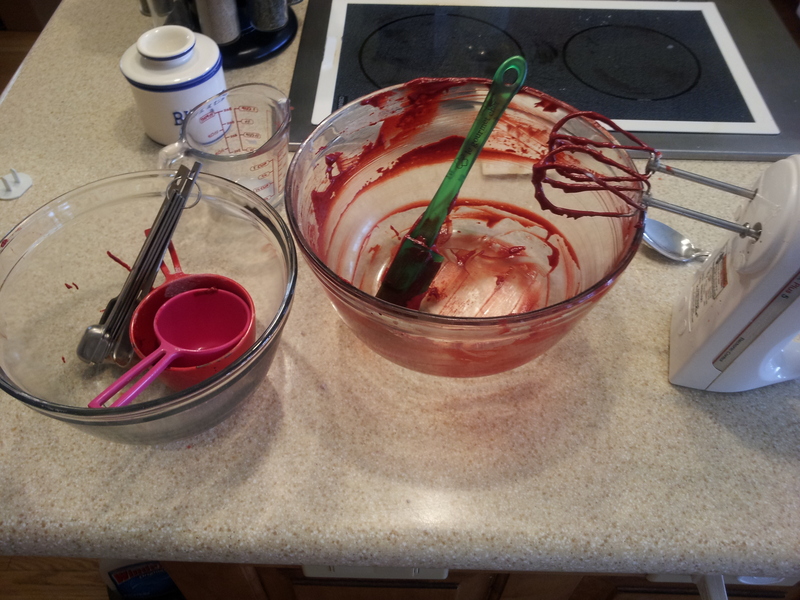 And during the mixing and frosting (and cleaning up drops of color), they can share the legacy of the Red Velvet Cake. Cream butter and sugar; add eggs one at a time, beating after each one. Set aside. In another bowl, sift together flour, salt and cocoa. Hold vinegar, soda and vanilla until end of mixing. Now begin adding dry ingredients alternately with buttermilk and food coloring to sugar mixture, ending with the dry ingredients — the total mixing time should not extend past 2 minutes. Add the vanilla. In a small cup, mix the vinegar and soda together; add to batter at end and fold in — do not beat. Pour into two 8 inch pans and bake at 350 degrees for 30 minutes. Have always LOVED this cake. Thanks for the recipe!